Combined Army Waterslide Decals 105 x 148mm sheet. Includes generic and Sectorial Army logos for the Combined Army faction. Also includes different black and white alphanumerical symbols. 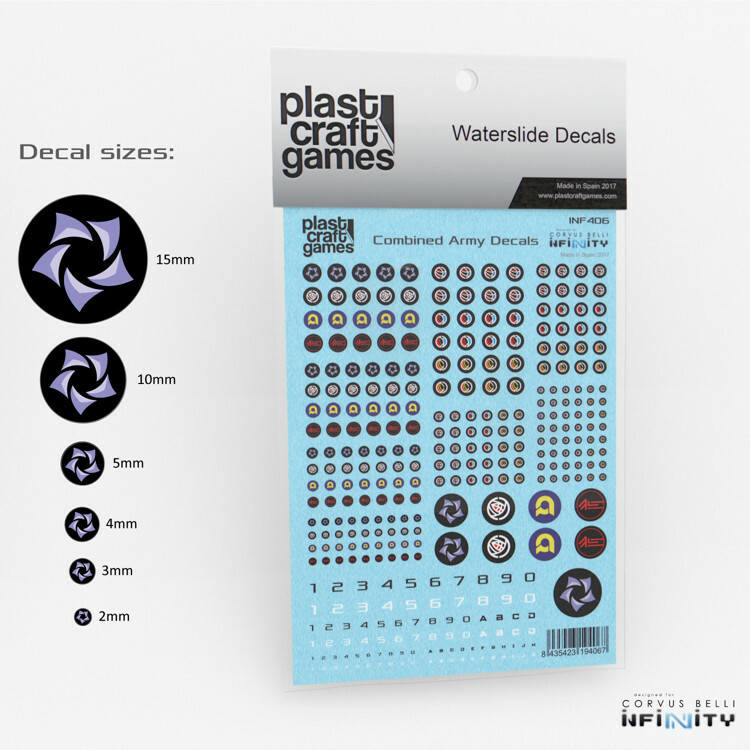 This sheet includes 242 decals with different diameters: 15mm, 10mm, 5mm, 4mm, 3mm and 2mm. Full color opaque high-detailed decals. Decals are to be applied with water, no solvent required. You can also use some decal setting solution to improve the finish on uneven or rough surfaces. 2- Immerse the decal in warm water for 5-8 seconds. 3- Remove from water and remove any excess water. 4- Place the decal to the desired surface lifting the decal from the backing paper with the help of a brush.